Home » Wheel Motor » Are Friction Brakes Redundant on Electric Vehicles & Hybrids? Are Friction Brakes Redundant on Electric Vehicles & Hybrids? The Toyota Prius, the world's first mass-produced hybrid vehicle, went on sale in Japan in 1997. 18 years later with sales surpassing 8 million vehicles, we're starting to get a clear picture of how durable vehicles powered by electric powertrains are. The humble Prius has proved so durable, with regular news of taxi operators surpassing 1 million km (the record stands at 1.5M km), there is even a thread on the priuschat website designated for Prius owners who have passed 299,999 miles (480,000 km). Not only are most Prius achieving these distances on the original battery pack (dispelling that urban myth) but in many cases they are also still on the original factory fitted set of brake pads!! With a Prius able to use brake regeneration down to 10 km/h, industry standard hydro-mechanical friction brakes move from being a system made up of consumable parts to a durable system that lasts the life of the vehicle. Typical brake pad life expectancy on an ICE car is between 50-100,000 km with brake rotors needing replacement every 100-200,000 km so the increase in Prius brake life is in the region of 10x. If the relatively low powered 50 kw electric motor / generator in the Prius has made friction brakes 90% redundant, then vehicles like the BMW i3 with a much more powerful electric motor (125 kw) and aggressive speed variable brake regeneration capable of bringing the car to a complete stop, make friction brakes entirely a legacy system whose only function is to provide very low duty-cycle safety functions such as Anti-Lock Brakes (ABS) and Electronic Stability Control (ESC). 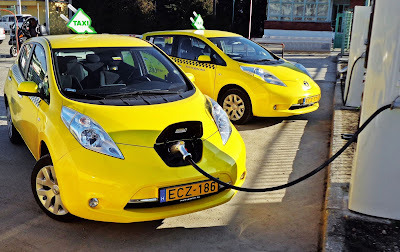 Taxi operators running fleets of Nissan Leaf are also reporting high mileage on original brake pads and no doubt given enough time will also pass 500,000 km without a pad &/or rotor change. Leaf owners have the added benefit of not having an ICE to service (Prius ICE's reportedly consume excessive oil above 500,000 km) and with typical electric motor life measured in the 20-40,000 hour range, electric only powertrains could last in excess of 2 million kilometres of trouble free motoring, compared to a typical ICE car life expectancy of 320,000 km (200,000 miles). The more that brake regeneration becomes an auto industry standard, the more inevitable the elimination of the dead weight and costs associated with legacy friction brake systems seems. In order to allow electromagnetic braking to functionally replace all mandatory safety systems like ESC, each wheel requires an electric motor to drive / brake each wheel independently. Technologies that we take for granted these days — like stability control and anti-lock brakes — paved the way for computer-controlled cars, and these long-established safety technologies are mandated by NHTSA etc. Automakers today agreed to make automatic emergency braking (AEB) standard on most U.S. cars by 2022. Automatic braking, like lane keeping and dynamic cruise control, is considered a precursor to fully autonomous vehicles. The converging vectors of vehicle electrification and self-driving cars will accelerate the need to consolidate all vehicle dynamic controls for propulsion and braking within a single system, i.e. Software Eats the Automotive Powertrain. Stay tuned, we'll delve into electromagnetic braking in a future post.